UNITED NATIONS, Nov 15 2012 (IPS) - When the United Nations commemorates World Toilet Day next week, there will be a lingering question in the minds of activists: how best can water and sanitation be given high priority in the proposed Sustainable Development Goals (SDGs) in the U.N.’s post-2015 economic agenda? 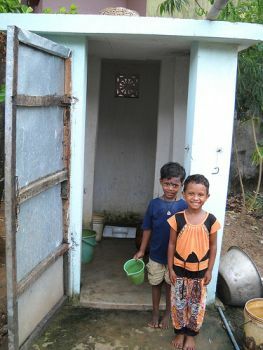 Dr. Jennifer Platt, sustainability director at WASH Advocates in Washington, told IPS that World Toilet Day on Nov. 19 is a great opportunity to start thinking outside the stall – about water, sanitation, and hygiene (WASH). As cornerstones of public health, WASH should be the first step of any development initiative. “Sustainable water, sanitation, and hygiene for all should absolutely be one of the key goals in the post-2015 SDGs,” she added. The highly-touted Millennium Development Goals (MDGS) include a reduction by 50 percent of the proportion of people living in extreme poverty and hunger; reversal of the spread of HIV/AIDS, elimination of gender inequality; achievement of universal primary education; reduction of child mortality; improvement of maternal health; sustainability of the environment; and a global partnership for development. The target date to achieve these goals is 2015. But water and sanitation wasn’t one of the eight primary goals and remained only as a subtext under “environmental sustainability”: a call for a reduction by 50 percent of those who do not have access to drinking water and adequate sanitation. Currently, over 800 million people have no access to safe drinking water and over 2.5 billion people are living without adequate sanitation. While most developing nations have made limited progress in providing clean water, the targets for sanitation have remained virtually unreachable. Platt said the discussion document at the United Nations provides a startling example of the continued omission of sanitation in many development agendas. Because 2.5 billion people don’t have access to sanitation, this issue isn’t going to go away overnight, she said. “Further, it could be argued that sustainable WASH influences the effectiveness of every single focus area listed youth employment, energy efficiency, food security, sustainable cities, oceans management, and resilience,” she added. Hannah Ellis, international campaigns manager for the London-based WaterAid, told IPS that water and sanitation are basic human rights that underpin health, education and livelihoods – and problems associated with lack of access impact on virtually all aspects of human development. The MDG targets expire in less than three years, yet one in 10 of the world’s population still do not have access to safe water and nearly 40 percent of the world’s population don’t have access to adequate sanitation services, she added. “If present trends continue, the Millennium Development Goal to halve the proportion of people living without adequate sanitation services will be met in 2165, 150 years behind schedule,” she warned. “A new goal on universal access to basic water and sanitation services as a fundamental human right, with a target date for achieving universal access to basic water and sanitation services by 2030 would be a good start,” she added. Nick Burn, chief of programmes at Water For People, told IPS that sanitation and water play a vital role in the social and economic development of countries, and therefore must remain a central focus of sustainable development. “Yet, when we define success as simply having access to the infrastructure, we neglect to provide a permanent solution that will contribute to overall sustained development,” he said. This is because latrines break down and no one can fix them, Burn said, pointing out that they fill up, and no one is there to empty the pit or septic tank. “This is a failure for international development, as it does not provide a service that will last well into the future,” he noted. Moving forward, he said, there must be a clear shift towards defining the outcome as lasting sanitation and water services. “We must monitor our progress towards this goal with clearly defined indicators that track whether adequate services are being provided and meet growing demand of expanding populations, and whether the market system has developed enough to meet the needs of even the most poor and vulnerable,” Burn said. And this, he said, provides a way forward that allows development to occur because lasting services are a permanent solution to the sanitation and water crisis. Meanwhile, in a joint statement issued last week, the government of Finland, the U.N. children’s agency UNICEF, UN Women, WaterAid and the U.N. Special Rapporteur on the Human Right to Safe Drinking Water and Sanitation, called for an end to water and sanitation inequalities in the U.N.’s post-2015 development agenda. The MDGs have brought much-needed attention to neglected issues, such as open defecation, maternal and child mortality, and the need for sustainable access to water. “The international community has learned from this process and must now aim higher,” the statement said. On the eve of the consultations on the post-2015 development agenda, “we believe that the world must achieve and build on the MDGs, but must also craft even more ambitious goals. The joint statement also said the future development agenda must aim at tackling the most persistent of all challenges: inequalities in access to essential services to realise people’s rights. Crucially, among these essential services, it must aim for every person to have equal access to water, sanitation and hygiene. The post-2015 agenda must not move forward without clear objectives towards the elimination of discrimination and inequalities in access to water, sanitation and hygiene, the statement added.